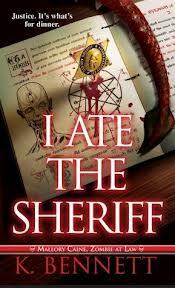 I Ate the Sheriff, K. Bennett’s third installment in the Mallory Caine, Zombie at Law series, is as fast-paced and entertaining as the previous novels. Mallory has settled into her reanimated existence, attending Zombie Anonymous meetings, working on a defense for her zombie-killing father, and trying to stay on the straight and narrow. Hard to do when you’re hungering for PhD brains, resisting the romantic advances of a werewolf and refusing to pick sides in a war between good and evil that is shaping up in Los Angeles. Though fictional, Mallory is a shining example of all a zombie is capable of. She regulates her need for human brains by subsisting on cow brains. She repairs her physical injuries and passes as a human. She continues relationships forged during her life, including with her perpetually stoned mother and the lover who had a hand in her zombification. Her quick wit and legal know how allow her to continue to live independently and thrive in her new circumstances. K Bennett once again puts together a compelling story with a believable, capable zombie lead character. An enjoyable read that belongs in every zombie lover‘s library. Pick up I Ate the Sheriff and treat yourself. Available at Amazon in Kindle or mass market paperback. 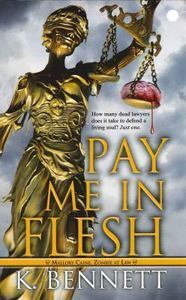 Pay Me In Flesh, by K. Bennett, is an excellent example of a novel that veers away from the tired, old stereotypes of shuffling, brain-dead zombies and shows a more realistic portrayal of an individual infected with the zombie virus. Lawyer Mallory Caine has lost none of her intelligence, sharp wit, or desire to do courtroom battle since her unsolved murder and subsequent reanimation. Now, in addition to all of the other problems faced by a single girl in the big city of Los Angeles, she must eat brains to survive. At least until she can find the person responsible for turning her into a zombie. Ms. Caine is no dirt covered ghoul content to stay on the fringes of society. Good grooming and beauty products allow her to pass in the world of humans. She takes her place in the courtroom, goes on dates with an old boyfriend, and trolls for brains in back alleys. Reluctantly trolls for brains. Yes, a zombie with a conscience. The tension is high and action fast as Mallory navigates a world of treachery and bias. It’s refreshing to read a zombie novel that eschews the one-dimensional and gives us a vibrant, multidimensional character that is neither good nor evil, but somewhere in between. A must read for zombies and anyone who loves them. Pay Me In Flesh (Mallory Caine, Zombie at Law) . Bennett has published two sequels, The Year of Eating Dangerously (Mallory Caine, Zombie at Law) #2 and I Ate the Sheriff (Mallory Caine, Zombie at Law) .